You must use this 2 hours and 40 minutes to become an honest man. Don't worry; Russell sings a lot tonight. I wouldn't want to deprive you of that. There are far too few films with Russell Crowe and Jerry Lewis; I think there should be more. And Russell has to wear his outfit from Gladiator. And Jerry has to wear his outfit from Slapstick Of Another Kind. I couldn't believe the last 3 hours could take so long. Bada Dada Dum is by my pal Jack Spillum. He said it was inspired by a Penguin Cafe Orchestra concert. But I think he was really inspired by Russell Crowe. This may just be me, but I'd rather hear Russell try his best to get thru a tune than this guy, or Hugh Jackman, over-singing their little hearts out. 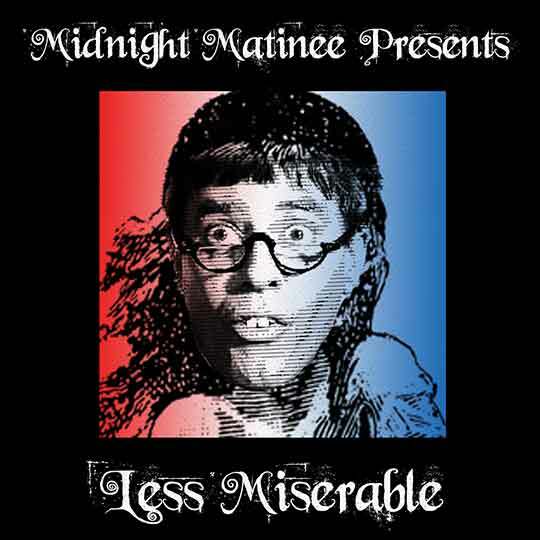 This movie really is miserable, isn't it? Why are you still listening? but wouldn't you rather hear hugh jackman over-singing as wolverine than russell try to get through a tune in gladiator? If wolverine fought gladiator, and it was set to music... uh oh. I'm going to stop typing right now, elsewise I'll have to do this one day. Welcome, Vancouver! This is normal; there is nothing to worry about. Nothing at all. There is nothing deeper in cinema than the Wolverine saga. Drink with me, for days gone by. JakeGould; please support this statement with footnotes, citations and quotes. It's the latent acid rising back up, Gary. It hangs around like crabgrass. but gladiator would bring something new to wolverine like aliens vs. predator; drop in santo and you've got a turkish film from the 70s. If I drink a Snapple after a nice meal, I get acid reflux. We like Gary from Vancouver! Then again, we like acid reflux, so maybe we shouldn't be trusted with opinions. And here I'm supposed to be getting work done. How is that possible now? Teacher, the radio ate my homework. schnall, are you behind this mania? I never drank banana flavored Snapple. I don’t think anyone has ever drank banana flavored Snapple. I am above and slightly to the left of this mania. But Rich pressed the play button so I blame him. It's still twitching a bit; let's finish it off. You could have held daniel hostage, forced him to go another hour. I'm just saying. For a friend. A buddy movie with Russell Crowe and Jerry Lewis as two outlaws on the lam who forge an uneasy friendship... it could happen. I think Jerry would insist on playing both heads, to show his vast range. I just rubbed up a bunch of ribs for tomorrow's bbq. Bunch? Herd? School? Thanks John! that was...less miserable. There hasn’t been any good “People Getting and Extra Head They Have Political Disagreements With” movies out there nowadays. Thanks Gary, and coelacanth∅, and Jake and Rich and all. You're right Jake; it's been quite a while since we're seen the extra head with different political viewpoint genre; we must get back to that soon. Yeah. One head is a Bernie Sanders supporter. The other head is someone who supports Trump but is also not white. We're in such a toxic place politically that people can't even accept the different political view of the second head that grows out of their boil/shoulder. It's a shame. One head is against universal healthcare and the other reminds it how with affordable insurance their two headed existence would have never have happened. Sorry, majority leaders of the senate don't have chins so that won't work. This song is very pretty, by the way. Can we add just a touch of Russell Crowe? Hey, all. Caught part of the matinee. It really rustled the crows. The senior politicians have hoarded all the chins. Hello Rich. Nice show-clicky star. JakeGould, how goes it? 2nd time tonight I heard a criticism of Russell Crowe's singing, rich.